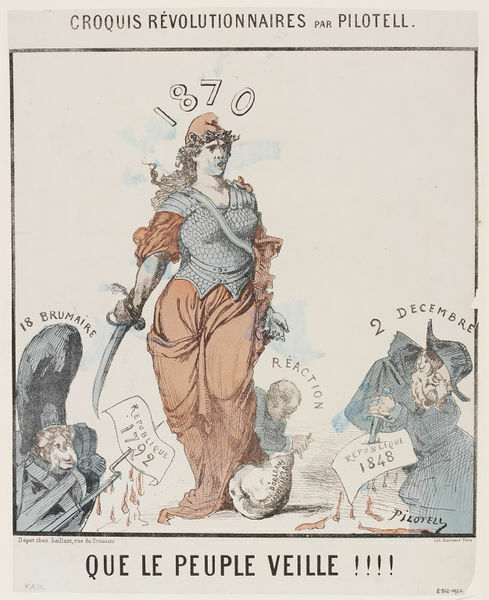 Satirical print showing a female figure, representative of France, standing and holding a sword and with the year '1870' written above her; at her feet, and with its head under her skirt, is a goose. The goose has the words 'Poire D'Orleans [word illegible] 1830' on its side and is held at the tail by a man; the word 'Reaction' is written above him. To the left is a soldier carrying a rifle, his bayonet run through a sheet of paper which reads 'Republique 1792'; above him are the words '18 Brumaire'. To the right is a caricature of Napoleon III; he is driving a dagger through a sheet of paper with the words 'Republique 1848' written on it. Print from a set of caricatures, broadsheets and illustrations in ten volumes. Each volume is half-bound in red leather, gold tooled and stamped with imperial emblems, title etc. 'Que Le Peuple Veille!!!!' 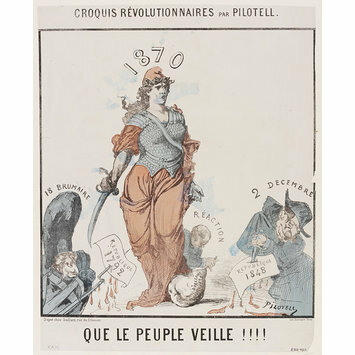 Satirical illustration by Georges Labadie Pilotell showing a female figure, representative of France, and a caricature of Napoleon III. Hand-coloured lithograph, France, 1870-1871.